Francis Campbell was the son of Hugh and Mary Campbell (nee Haugh). Francis was born in Stewartstown about 1893. The family moved to Laganvale Street in Belfast. Francis was a general labourer. His mother was a widow. 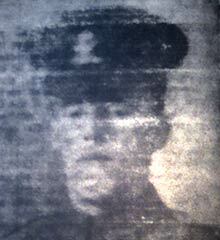 Rifleman Frank Campbell was serving with the 15th Battalion of the Royal Irish Rifles when he was killed in action in France on 9th April 1918. 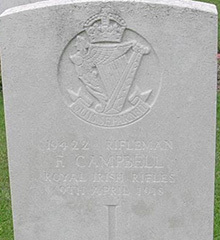 Frank’s brother, Rifleman Charles Campbell (14160), served with the Royal Irish Rifles and also died in the war.